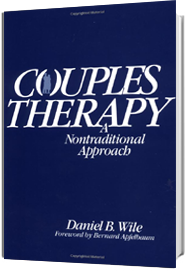 In this approach, you focus on the intrinsic difficulty of being in a relationship – the ease with which partners find themselves in an adversarial or withdrawn cycle without knowing how they got into it, not wanting to be in it, and not knowing how to get out of it. The crucial problem is not the one the partners are arguing over but their inability to recruit one another as resources in dealing with it. 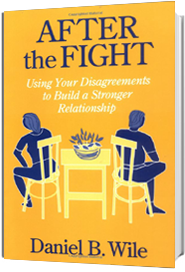 You deal with couple fighting not by encouraging restraint but by serving as spokesperson for both partners and helping them make their points. The inner atmosphere of a relationship is continually changing. There is the possibility at any moment to capture an intimacy that is intrinsic to that moment and to create a collaborative (empathic) cycle. 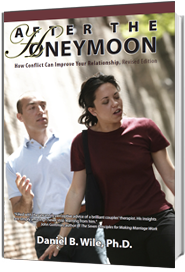 Partners are repeatedly in the position of having to choose between expressing their feelings and precipitating a disagreeable interaction or withholding them and increasing their sense of isolation. A relationship is, in some sense, the attempt to work out the negative side effects of what attracts you to your partner in the first place. Intimacy comes from telling your partner the main things on your mind and hearing from your partner the main thing on his or her mind. A common pattern is to alternate between periods of indiscriminate accusation and indiscriminate politeness. Partners in a troubled relationship look and act infantile. They argue over trifles, sulk, and rage. What is important to take into account, however, are the conditions under which they are operating. These people are behaving in an “irrational” and “intolerable” manner because they are dealing with an intolerable situation. People may become uncompromising because of the hidden compromises they are already making. People make compromises so quickly and so automatically that they are often unaware of doing so. Accusing turns your partner into someone who can’t listen. Listening turns your partner into someone who might listen. Although a fight isn’t a time to expect to work out any issues, it may be only then that we ever bring up these issues. We are told not to dig up grievances from the ancient past. But this is what we feel compelled to do to find clear examples of what is happening in more subtle ways now. We are told not to say “always” or “never,” since it provokes our partners and can easily be refuted by their pointing to an exception. But when we feel that words are failing us, “always” and “nevers” spring naturally to our lips. If such words didn’t exist, we would have to invent them. We are told to make “I statements” rather than “you statement.” But sometimes nothing but a good “you statement” will do.